Whenever I’m asked about the main ingredients of a successful marketing campaign, I can’t go past the need for greater knowledge of the customer. It’s the foundation on which all else is built. ‘Know your customer’ is such a simple but important dictum that it should be inscribed on the walls of marketing offices around the country. But while everyone might agree with this imperative, it’s harder than ever to implement in today’s more vibrant, diverse and fractured marketplace. With so many subcultures and diverse tastes, priorities and lifestyles, marketers must find ways to look beyond mainstream trends to identify the relevant patterns and preferences of their customers. In the next five years, the key tool marketers will use to do this is big data. Typically, the data a business collects on a customer represents only 1% of their informational profile, gathered when they are physically in the store or clicking through the website. This information might be useful to track a few key customer details – which links brought them to the website, which parts of the website they clicked through to, how long they stayed and what, if anything, they bought. But that information, while partially useful, offers only a pin-hole view of your customer, devoid of colour and not completely reliable. 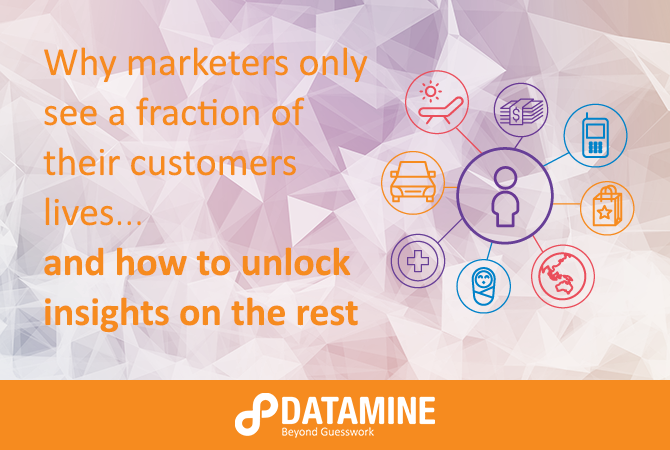 What’s more valuable is a broader view of customer behaviour – one that encompasses more of the 99% of data representing the time a customer isn’t engaged with your business. 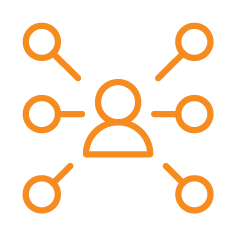 Imagine for a second that your business was able to build buyers’ profiles for your customers based on a wide range of information derived from external data sources. What other kinds of products are your customers buying? Where do they get their news from? Which causes are they passionate about? Do they typically buy their groceries from wholefoods outlets or fast-food outlets? This information, especially when aggregated into a single coherent picture, can reveal deep insights about successful marketing themes and factors which contribute to the success of certain products. Research shows that many advertising themes don’t translate well across generational and social group cohorts, so learning more about the overall composition of your customer groups could save money on dud campaigns. More deeply than this, data derived from external sources might also indicate potentially fruitful times for individuals to be reached through targeted and personalised advertising. Are there any patterns to a customer’s discretionary spending? Understanding how the monthly pay cycle influences spending through banking data could inform strategies around advertising for large discretionary spending items. Similarly, data derived from airline, train or GPS might indicate that people have regular patterns of movement indicative of certain types of spending. This could help businesses present tailored offerings for accommodation, currency exchange or tourism experiences. In this way, data drawn from a wide range of sources can not only enrich your business’s understanding of its customers, it can also help it present tailored offerings in campaigns at just the right moment to support a sale. Using the range of available customer data in smart and innovative ways allows businesses to improve their return on advertising investment and get every marketing dollar working harder. But there are added benefits for businesses engaging with big data, one of which is unlocking the value of data your business collects as part of its everyday operations. A business’s customer data is a strategic asset, the full value of which can only be realised when used in tandem with other forms of customer data. This aggregation of data makes advanced techniques for data analysis meaningful in a way that would be of less value applied to a smaller data set. The process of moving towards full data liquidity promises to unlock untold value for a range of businesses and organisations. Maintaining customer confidence in the ethical and non-invasive use of their data is key here, as is the protection and governance of proprietary datasets through the use of best practice data exchange infrastructure. Working together to reach full data liquidity promises to yield significant benefits for consumers, government and businesses alike – but many would argue the opportunity is greatest for savvy marketers who can surprise and delight customers through true data-driven personalisation. 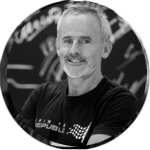 Brad Moult is a Managing Consultant at Datamine partner Data Republic. With over 15 years’ experience, Brad has had worked extensively with the marketing and insights teams of major organisations, both in the UK and Australia. At Data Republic, he leads major data exchange projects between Data Contributors and Participating organisations.